Fall (or autumn as I prefer to call it), is definitely upon us. At least the calendar says so. While here in Texas Mother Nature is taking her time to give us a little fall weather, the grocery stores have definitely served up a thousand ways for you to taste the official flavor of fall, pumpkin. Probably one of the most pinned or hashtagged items on social media right now, pumpkin has replaced apple as the official flavor of the season, at least according to BusinessWeek – and I couldn’t be happier. So if your Starbucks #PumpkinSpiceLatte isn’t enough to keep your tastebuds satiated, here are just a few of the items I picked up this week at Walgreens, Walmart and Tom Thumb. 1. Duncan Hines Pumpkin Spice Cupcakes: Comes with its own pumpkin spice icing! 2. Nestle Coffee Mate Pumpkin Spice: It’s not just for coffee; try this for making your french toast! 3. Kellogg’s Pop Tarts Pumpkin Spice: In less than two minutes you can have a taste of something like pumpkin pie! 4. Jello Instant Pudding Mix Pumpkin Spice: I’m thinking there’s going to be something delicious made with this soon! 6. Betty Crocker Pumpkin Cookie Mix: Need pumpkin stat? Then cook these up with a cream cheese icing for that almost-homemade cookie smell throughout the house. 7. Krusteaz Pumpkin Pie Bar: I want to eat these now – especially since they have a Gingerbread crust. It’s like heaven in a bar. 8. Pepperidge Farm Pumpkin Cheesecake Cookies: How could these be bad? Pumpkin + Cheesecake = happy tastebuds. 9. Kraft Jet-Puffed Pumpkin Spice Marshmallows: Not only are they pumpkin flavored, but pumpkin-shapped too. We use them for s’mores and fell in love. 10. Pumpkin Candy: Every candy has made a version of pumpkin-something shaped or flavored. The highly coveted and posted Pumpkin Spice M&Ms couldn’t even be found, but Hershey’s Kisses and Candy Corn have both turned into pumpkins this season. And if you are looking to find more pumpkin, check out McDonald’s, Einstein Bros., Seattle’s Best and Dunkin Donuts for more pumpkin, drive-thru style. Join me in all kinds of PUMPKIN FUN on my Pinterest! Love it! I have 2 of your items in my cabinet right now 😉 Couldn’t wait for fall to officially start before I started partaking of pumpkin! Those marshmallows look SO YUMMY. I love the idea of using them in S’mores! 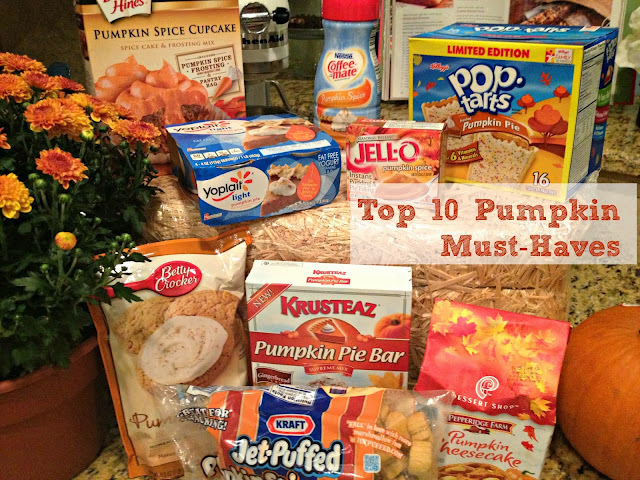 I really need to figure out my love for pumpkin before I try these out. I really love pumpkin muffins, but pumpkin coffee isn’t a favorite of mine. I’m thinking the pumpkin cookies sound delish!